Just a quick update. 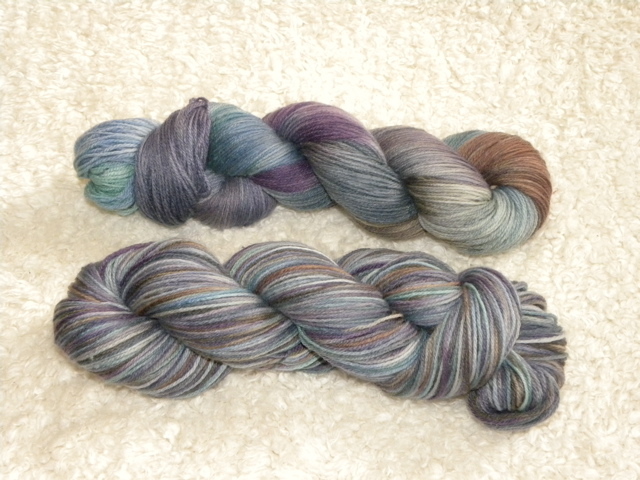 Remember the two skeins I showed you at the end of my last post? Here they are finished. I seriously love them both. Above is ‘She Hates to Wear Dresses’. I painted two of these at the same time so they’d be the same. 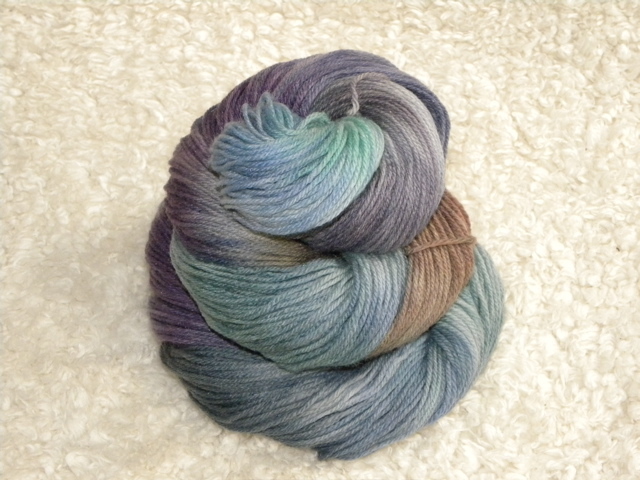 Do you want to see the magic that happens when one of them is re-skeined and the colors are all jumbled up? Below is the exact same colorway, only the colors have been redistributed. I can’t decide which I like better, the skein with the colors chunked up together or the skein with the colors jumbled up. Again, I can’t decide which I like better. What do YOU think? 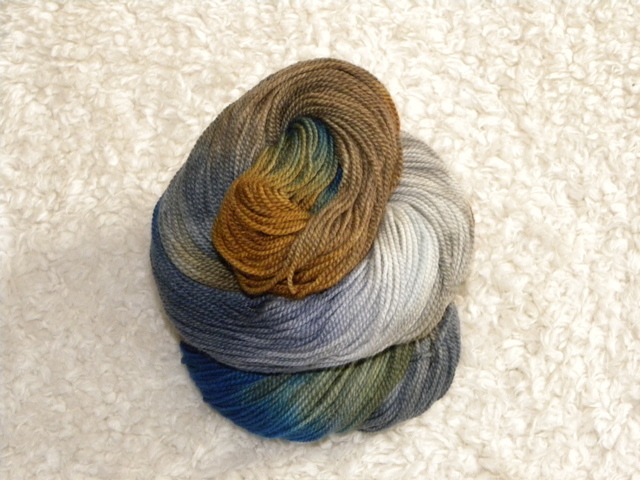 Would you rather buy the skeins with the colors left as they are, the way they were painted on in patches of color….or do you like the skeins better when the colors are redistributed, to give a better idea of what they’ll look like knitted? I can’t decide the best way to sell them. 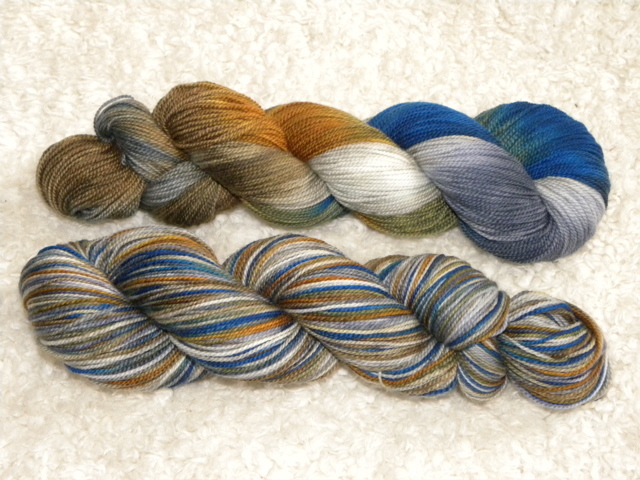 Maybe I’ll just have to make the decision per each colorway, whether I think it will look better left as is or re-skeined. I’d love to hear your thoughts on this. Leave me a comment if you’d like to give your two cents! dani i love the one called she hates to wear dresses! that is soo me i hate dresses and skirts and john is always trying to gey me to wear them lol, not even on my wedding day did i wear a dress! when i first looked at it i emediatly saw you knitting it into a scarf.great job sis!…hi to emmet the pirate! Janina, I feel the same way quite often. It’s not easy to get me out of my jeans and into a skirt or dress. I’m a little better about it in the summer, but I SUPER hate it in the winter, when my legs get so cold. And I’m so not a girly girl at all…those colors suit me better than others. i say sell them in pairs. one of each. Breida I would love to sell them in pairs but one skein is enough to make a pair of socks or a small shawl, so most people will only want to buy one at a time. I’d love to keep reskeining one and keeping the other as is, but I’m worried people that come to the festivals might see them and not realize they are the same…and then if they DO want to buy more than one of them, they might not realize that they can… that each skein has a twin. It’s a dilemma. Re-skeining probably gives the buyer the best idea of what a finished product will look like since you don’t do long color blocks – so reskeining is probably better for sales. They look wonderful. I got 11 more skeins dyed this weekend. How did you do? 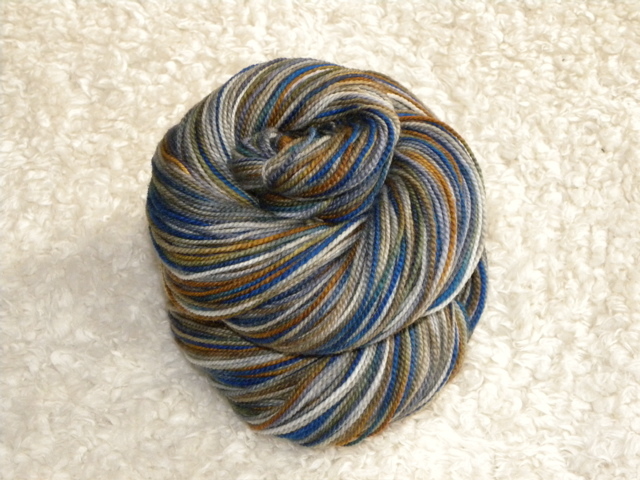 I have been trying to figure out the same thing: re-skein or not to re-skein. I asked a bunch of my knitting friends and they all voted for re-skein because it easier for them to imagine what it will look like knitted up. 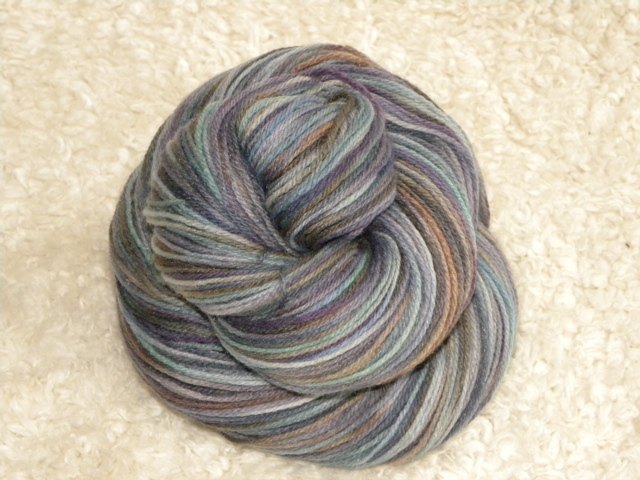 Although some times I really hate to re-skein it because I love the way the color looks all blocky. But, I do get really excited about re-skeining it to see what it will look like! Definitely better with the colors all jumbled up. Too hard to imagine the mix without you doing it for us.